Finally, heading into their fifth season. Finally, after one off-the-field controversy after another. Finally, Real Salt Lake is about one thing and one thing only: soccer. Not the stadium. Not tax money. Not county politics vs. state politics. Not business plans. Not the threat of leaving. Not Salt Lake City vs. Sandy. Just soccer. Eleven guys wearing jerseys of one color trying to kick the ball into a net belonging to 11 guys wearing jerseys of another color. Sounds easy compared to everything that’s gone before. Now that it’s down to what happens on the pitch, there’s every indication things could end up going well for this franchise. After RSL finally got into their new stadium last year, they ended up making the Major League Soccer playoffs for the first time in club history, and followed that up with a run all the way to the Western Conference finals. The rest of the American soccer community also seems to sense Utah’s potential. The season opener on Thursday—officially billed as “First Kick” rather than “Opening Day”—will be televised on ESPN2 and ESPN Deportes. 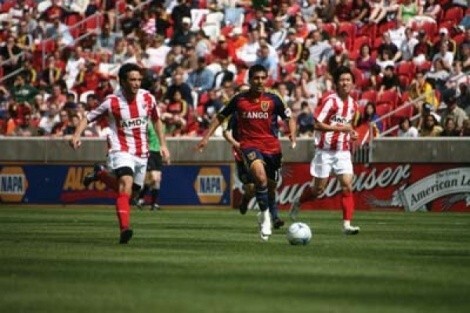 MLS has selected Rio Tinto Stadium as the site for the league’s 2009 All-Star Game on July 29. The U.S. women’s team will play Japan here on May 23, and the American men’s squad will take on El Salvador on Sept. 5. Whatever your views on how they ended up with a stadium in Sandy, RSL is playing there. There’s nothing left to do but watch the games.